Maastricht is a medieval city in Limburg, The Netherlands and has plenty of things to do. If you’re looking to spend a weekend or one day in Maastricht, continue reading. Maastricht is a great city in The Netherlands to spend one full day or even a weekend. If you’re don’t know what things you should do in Maastricht, where the best restaurants are and how to get to Maastricht, then continue reading. Here you will find an itinerary to spending 24 hours in Maastricht. Maastricht is a wonderful city in the province of Limburg, The Netherlands. Slowly the city becomes more popular with foreign tourists, however, this happens very slowly. There are quite a lot of (foreign) students who live and study in Maastricht so you will find lots of chilled out cafes and stores in this city. The province of Limburg is well-known within The Netherlands for the friendly people, the regional food and the beautiful hilly surroundings with picturesque villages. It’s very easy to travel to Maastricht and visiting Maastricht can even be done as a day trip from Amsterdam. Continue reading to find what to do and see in Maastricht in one day. As you’re entering the city of Maastricht it’s the first time for breakfast. For the best breakfast in Maastricht, you’d have to go to ‘t Wycker cabinet. At this restaurant in Maastricht they serve breakfast on Monday- Friday from 10:00- 12:00 and on Saturday & Sunday from 09:00 – 12:00. My favourite things to eat at ‘t Wycker cabinet is the Doux et Vite. This has baked banana bread, organic yoghurt, fresh fruits, home-made granola and more. You will be filled for a good day of visiting and exploring Maastricht. Another great place for breakfast in Maastricht is De Bisschopsmolen. At this bakery, they bake bread, energy bars and more. But, De Bisschopsmolen is also great to visit for a quick breakfast, or even lunch. And if you’re looking for snacks to chew on when exploring Maastricht, and not starve while doing so, then you can buy the best healthy snacks of Maastricht here. After the best breakfast of Maastricht, it’s time to create your own ‘vlaai’. A ‘vlaai’ is a typical regional food of Maastricht and the province of Limburg. Remember the breakfast spot of de Bisschopsmolen I referred to at the beginning of this article? Well, that is the bakery in Maastricht where you will make your own vlaai. A ‘vlaai’ is not a pie, it’s a flan. For 25 euros per person, you can make your flan in Maastricht with the help of one of the bakers. When the flan is preparing in the oven you will get a tour through the mill and after that, your masterpiece will be finished and ready for you to take it home. This is one of the best things you can do in Maastricht. If baking your own ‘vlaai’ in Maastricht is too much, then visit De Bisschopsmolen for a piece of vlaai. Because you cannot leave Maastricht without trying regional foods. Every first and third Sunday of every month you can bake a vlaai in this bakery in Maastricht. During the months May, July, August and October there are extra workshops. The workshops start at 10:00. You can reserve at their website here. If you scroll down, you come to the reservation screen. The whole website is in Dutch so Google Translate will be helpful. After filling your stomach at some of the best breakfast spots of Maastricht and baking a flan, it’s time to explore this beautiful city in Limburg. You cannot visit Maastricht without discovering the city. There are beautiful streets and monuments that you have to see when you’re in Maastricht. 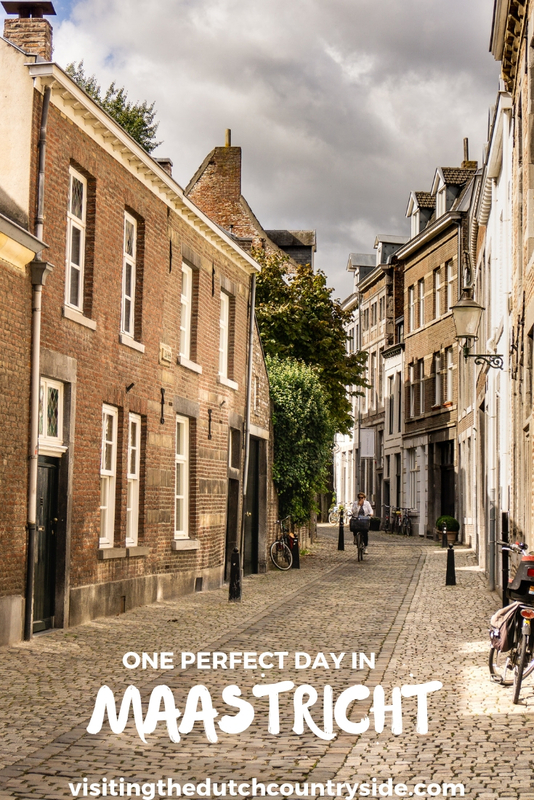 So that’s why doing a walking tour through Maastricht is one of the things you have to do when you have one day in Maastricht. Rechtstraat, Brusselsestraat, Boschstraat, Markt, Hoogbrugstraat, Tongersestraat, Grote Gracht, Stokstraat, Muntstraat, Vrijthoof, Grote Staat, Bredestraat, Bogaardenstraat, Kapoenstraat, Lenculenstraat, Achter het Vleeshuis, Sint Bernardusstraat, Wolfstraat, Kleine Gracht, Nieuwstraat, Sint Servaasklooster, Van Hasseltkade, Grote Looiersstraat, Sint Pieterstraat, Capucijnenstraat, Kesselskade, Lage Kanaaldijk, Kleine Straat, Platielstraat, Tongerseweg, Onze Lieve Vrouweplein, Spilstraat, Wethouder van Caldenborghlaan, Maastrichter Brugstraat, Wycker Brugstraat, Jodenstraat, Cannerweg, Wilhelminasingel, Kleine Looiersstraat, Abtstraat, Koestraat, Sinter Lambertuslaan, Weert, Keizer Karelplein, Papenstraat, Stenenbrug, Tafelstraat, Achter de Molens, Achter de Comedie, Sint Amorsplein. As Maastricht is a medieval city that also existed back in the Roman Empire, there are plenty of monuments to visit. This is one of the best things that you can do in Maastricht. This beautiful building is located in the centre of the Markt square and dates back to the 17th century. This church is located on the famous square of het Vrijthof and is one of the best places to get a stunning view of Maastricht. The Sint Janskerk of Maastricht is beautiful itself, but climbing the tower is something you won’t regret doing and will leave you in awe. The view is stunning, and you can look all over the beautiful city of Maastricht. The entry to the church is free, if you want to climb the tower it will cost you 2,50 euros as an adult. The church is only opened from Holy Saturday until the last Sunday of October. The Helpoort is the oldest city gate of The Netherlands and a monument you cannot miss. This city gate in Maastricht was built in 1229 and is the only city gate of Maastricht that is left. This gate is part of the first city wall of Maastricht and was used for two centuries. Between Easter Monday and the last Sunday of October, there are volunteers between 13:00 – 16:30 who will answer all your questions about the city gate and the history of Maastricht. This church is the oldest church in The Netherlands and one of the Unesco monuments of Maastricht. Some parts of the Sint Servaas basilica in Maastricht date back to the 10th century, while others to the 12th century. You can visit the church, the hallways and the chambers every day. Closed on the 1st of January, during Carnival, 1st day of Easter, 1st day of Pentecost and 1st and 2nd Christmas day. This is the oldest bridge in The Netherlands and dates back to the 13th century. The Sphinxkwartier in Maastricht is an area that is known for its industrial touch. It’s an upcoming area, where worn down factory buildings get a new destination. One of the things you have to visit in the Sphinxkwartier is Het Bassin. This century-old harbour is surrounded by warehouses, factories and other monumental buildings. In this neighbourhood of Maastricht, you will find a lot of art galleries and restaurants in the basements of these houses. Don’t forget to have a look at the street art of Maastricht that you can spot at the walls near the Boschstraatkwartier. The next neighbourhood in Maastricht you have to visit is the Jekerkwartier. This is the area of Maastricht where you will find an old and charming neighbourhood filled with great boutiques, art galleries and antique shops. Here you will find more students and locals than in some other areas of Maastricht. You can find a beautiful park on one side and picturesque, monumental buildings on the other. After the walking tour of Maastricht, it’s time to bring a visit to the most beautiful bookshop of The Netherlands and, in my opinion, of the world. Dominicanenkerk in Maastricht is one of the most beautiful churches of Maastricht and home to a bookshop. This old church doesn’t only have a bookshop, but you can find one of the best cafes for coffee of Maastricht here as well. Besides that, there are often exhibitions, presentations and readings. Don’t forget to walk around between the lp’s, CDs and DVD’s. In Maastricht you can find a great flea market at the Stationsstraat from 10:00- 16:00 every Saturday. In this market in Maastricht, you can find the best vintage fashion, antique furniture, art and plenty of more. The earlier you arrive the better, as many people are a big fan of the market, so the great pieces are sold quickly. After exploring a part of Maastricht it’s time to eat lunch. For the best lunch spots of Maastricht have a look below. This is one of the best lunch spots of Maastricht and is located in an old fire station. While De Brandweerkantine is a popular café for breakfast, lunch, dinner and drinks in Maastricht, it’s not too crowded so you’ll always have a spot. The café is very spacious, and the interior is very light. At De Brandweerkantine they serve organic and local products, and you will find a lot of vegetarian options at this café/ restaurant in Maastricht. You will be completely satisfied at this breakfast and lunch café in Maastricht. The food that they serve here is great and if you’re looking for a café in Maastricht that has a hipster atmosphere, this is it. For one of the best vegan breakfasts or lunches in Maastricht you have to visit Kafethea. P.s. If you’re a fan of a latte macchiato, you can get the best latte macchiato of Maastricht here. This restaurant in Maastricht is another great pick for vegans and vegetarians, but it’s a great restaurant for the food lovers. At this great restaurant in Maastricht you will share small dishes with your friends or family. Or if you’re like me, and like to eat, you will just order for yourself. In general, you’ll wait a little bit longer here than at most restaurants, but it’s worth it. This is also a great vegan and vegetarian restaurant to go for dinner in Maastricht. If you don’t fancy baking a flan or are visiting Maastricht another day, then you have to visit the caves of Maastricht. At the caves of Maastricht, you will find a long labyrinth with corridors that measure around 80 km today. There used to be 20.000 man-made corridors and 230 km. You can only visit these caves with a professional guide. Besides learning about the history of the corridors you will find remains of a shelter that dates back to the 18th century and the National Storage Facility 9. This storage facility is known as the ‘vault’ and was used to protect a large part of the national art treasures between 1942 and 1945 (second World War). The fort of St. Pieter is connected with the caves via several underground tunnels and dates back to 1700. This is the remaining piece of the fortress that used to protect Maastricht against the French, Spanish and many more. The fortress of St. Pieter in Maastricht can only be visited with a guided tour. The tour of the North caves starts daily at 14:00. A combi ticket for the Fort St. Pieter and the North caves leaves daily at 12:30. It’s best to buy tickets online via this official website of Maastricht Underground, this way you are certain that you have a spot on the tour. At this website, you will also find the prices and addresses. When you’re visiting Maastricht, you cannot leave the city without regional souvenirs. Of course, you have the ‘vlaai’ that you baked, but there’s more. Visit Adriaan de Smaakmaker. This small shop is filled with home-made jams, chutney, mustard, honey and more. it’s all made in the small kitchen of the store. Buy the ‘Maastrichtse Stadspark Honing’ (honey from the park of Maastricht) or ‘Hazelnootmosterd’ (hazelnut mustard). The best part about this store is that often times you can try the tastiness. After that, you should visit Japonais for incredible stuff and stories from Japan. But also, don’t forget to visit Turasnu where you can buy hand-made clothes and accessories from Mexico. Shopping in Maastricht can best be done around the following streets: Rechtstraat, Bredestraat, Alexander Battalaan, Heggenstraat. Maastricht has a lot of museums and galleries that are great to visit, but the Bonnefantenmuseum is one of my most favourite museums of Maastricht. The building alone is a sight to see and designed by Aldo Rossi. In this museum in Maastricht you will find incredible sculptures from the Middle Ages, Dutch art from this area of The Netherlands and plenty of more incredible art pieces. Click here for their website to get more information. Maastricht is well-known within The Netherlands for having the Burgundian lifestyle and with that comes food. Pieke Potloed is the best restaurant in Maastricht to get traditional food. It’s not the best suitable for vegetarians or vegans, but if you want to try Limburgs/ Dutch food in Maastricht you have to try zoervleis at Pieke Potloed. What I also love about this restaurant in Maastricht is that the dishes are local, and the restaurant is centrally located. If the weather is lovely you can sit outside on their terrace. And one last thing, the staff is truly wonderful. At Cafe Sjiek you will find yourself in a typical Dutch brown café and one of the best restaurants of Maastricht. And while a café might not be the most suitable place for getting a great dinner in Maastricht, Café Sjiek is different. This is another restaurant in Maastricht that serves traditional food. And it’s incredibly good. The zoervleis is again a must if you haven’t tried it before. For the readers who are searching for great vegan and vegetarian restaurants for dinner in Maastricht, Eetcafe Ceramique is your spot. The food is mostly based on what the seasons can offer, and the combinations are surprising. Surprising in a good way. The flavours are something else and will leave you wanting more. The staff is very friendly and this restaurant in Maastricht will feel like a home away from home. This is one of the best vegan and vegetarian restaurants of Maastricht. The best way to end a perfect day in Maastricht is with watching the sunset along the Meuse river. What’s a better location than the oldest bridge of The Netherlands? The Sint Servaasbrug is perfect for experiencing one of the must do’s of Maastricht. You will witness the sun slowly going down when the beautiful golden hour light shines on Maastricht. It’s magical. This is the moment when you’re in doubt whether fairytales exist. The beauty of the city, the sound of the river that divides the city and the chatter of friendly people that enjoy the same sunset. If you don’t know what to do in Maastricht at night, but are in need of a calm ending of a great day trip to Maastricht, then finishing this perfect day in Maastricht with a beer or wine (or any other drink) is a great ending. When you’re in need of a final drink after a long but fulfilling day of exploring Maastricht it’s only logical that you’ll visit Den Oude Vogelstruys. This café is the oldest café of Maastricht and dates back to the 14th century. The current building dates back to 1730. You can try some incredible regional cheeses with some of the best beer of Maastricht. This is the best place of Maastricht when it comes to craft beer. You can decide, I don’t recommend you try them all, between more than 100 different craft beers. This Belgian beer café in Maastricht is a must visit if you’re looking for a chilled evening with the best beer in town. Click here for more information. De Wienkontor is one of the best wine bars of Maastricht, so if you’re not a fan of beer, this is your spot. At De Wienkontor they have more than 120 wines that you can choose from ranging from house wines to some very exclusive wines. While the interior feels very modern, it also has the typical Dutch ‘gezellig’ atmosphere. Click here for more information. From Amsterdam: If you want to make a day trip to Maastricht from Amsterdam, or are looking to continue your travels through The Netherlands, you have to look at this route. Take the train from Amsterdam Centraal in the direction of Maastricht. Get out at Maastricht. The journey to Maastricht from Amsterdam by train will take you around 2:20 hours. From Utrecht: If you want to travel to Maastricht from Utrecht by train you need to take the following route. Take the train from Utrecht Centraal in the direction of Maastricht. Get out at Maastricht. The train from Utrecht to Maastricht will take you around 1:50 hours. From Rotterdam: When you are making a day trip from Rotterdam to Maastricht, or want to visit Maastricht from Rotterdam for a few days, then you have to follow this journey. Take the intercity from Rotterdam Centraal in the direction of Eindhoven. Get out at Eindhoven. From Eindhoven take the intercity in the direction of Maastricht. The total train journey from Rotterdam to Maastricht takes you around 2:15 minutes. If you’re looking for good accommodation in the beautiful city of Maastricht, you’ve come to the right place. Here you will find the best places to stay in Maastricht for all budgets. From hostels to special hotels in Maastricht, you can find it here. Disclaimer: These links are affiliate links. When you book through one of these links I get a small percentage of the booking fee at no extra cost to you. Thank you for supporting me. For a full disclaimer click here. B&B De Hofnar, book now. Le Theatre Hotel, book now. I hope this itinerary to spending one day in Maastricht, The Netherlands has helped you a lot. I also hope that these pictures of Maastricht have inspired you to visit this beautiful city for at least 24 hours, it’s truly worth it. Maastricht has a lot of things to offer, and this article is only a small piece of it (the best piece of course). Have a look at the things you can do at the Christmas market of Maastricht here, for information about the airport of Maastricht click here. And if you’re interested in seeing more articles that I’ve written, click here. Share this post!! Hi, my husband and I had the good fortune to live in Maastricht for 3 years in the 1970’s. We have been coming back for visits for the past 3 years. We will certainly try some of the places you have mentioned. Incidentally, we always stay at the Kaboom Hotel and would thoroughly recommend it. Great article, many thanks. Living in Maastricht must’ve been very lovely. I can understand that you’d want to return to Maastricht often as it never fails to wow you. I’m so glad to hear that! I will have a look at the hotel you mentioned, thank you for the tip 🙂 Thank you for the lovely compliment.